Multimedia displays with speakers and loads of connection ports tend to carry either ridiculous premiums or gimmicky features, and generally fail to impress. Thankfully, the ViewDock does a bit better for itself. It has a decent screen, built-in iPod dock and a very competitive price. Normally, these units tend to come with poor displays perfumed with entertainment features. Here, though, even if you remove the exotic base, the monitor is excellent value for money. The resolution is refined, with crisp and detailed text showing through. And at only 5 milliseconds, the grey-to-grey response time is excellent. The default colour settings give you a good range of basic display options. After years spent using Apple's standard screen settings, we felt most comfortable in the ViewDock's RGB mode, which resembled Apple's default iMac colour setting in OS X. Other options flesh out colours in different ways, and there's a manual control panel if you want to tinker. Overall, the screen is very bright, with sharp edges and rich colours - all good for showing web graphics and movies, for example. At this price there's nothing to grumble about and for most people this is as far as their monitor needs would stretch. But if you want a slightly bigger screen, a 22-inch version is available for £344. Then comes the base. This is what really makes the ViewDock stand out. Around it are five USB ports, one of which must be dedicated for syncing with your Mac. Three ports give you plenty of connection options. Then, as a bonus, you have eight memory card slots that take all common types of camera card. The base is therefore like a large hub. You also get a speaker and volume control, although the sound that comes from it pales compared to most desktop speakers. There's no remote for the dock, which would have been a fun addition. When we first saw the ViewDock we assumed that simply docking your iPod would give you a shortcut to displaying its stored video up on the screen. Sadly not. 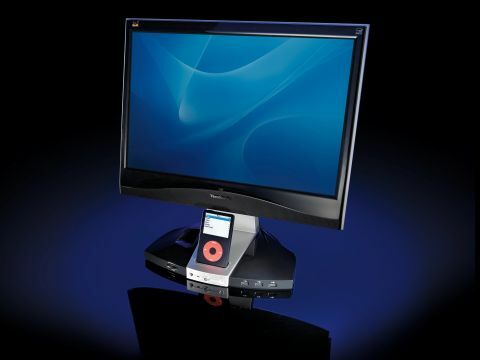 Of course, you can play video on the ViewDock, but you still need to go back through the USB cable to your Mac, play video in iTunes and then send the signal back to the monitor using a DVI or VGA cable. It's not much bother, but it's not the solution we'd expected. Two other downsides are power supply and positioning. The display came with a two-pin power cable for the dock, so you need an adaptor. Secondly, the monitor doesn't detach or have an adjustable height setting; it just pivots up and down. Despite that, though, the quality of the display is very impressive.